It’s time for the annual Woodley Park 900 Toys for Tots and a New Toys for Tots 300 on Saturday, December 7, 2013. All are welcome. You may shoot your distances in yards or meters. Bring the family! 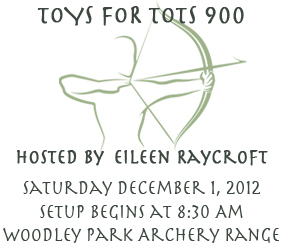 There will also be a fun Toys for Tots 300 on the Short Range starting at 11 am. Entry fee is one new, unwrapped toy per person. Setup at 8:30 am, official practice begins at 9:00 am. Entrance fee is new, unwrapped toy.